In September 2007 the English Riviera received international recognition for its rich geological, historical and cultural heritage, it became one of just 57 areas around the world to endorsed by UNESCO and welcomed into both the European and Global Geopark Networks. Since then the Global Geopark Network has grown and as of April 2018 there are now 140 UNESCO Global Geoparks. 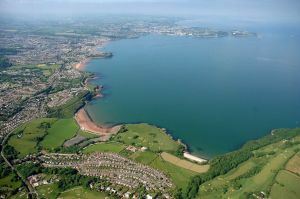 Situated within the stunning, rolling hills of South Devon, Torbay's geology has created the beautiful coastline of today, which fundamentally links the rich diversity of landscape with wildlife, people and culture. Undeniably, the geological tale behind the English Riviera Geopark is quite spectacular and one of extremes. From a seascape bathed in the warm and beautiful tropical seas of the Marine Devonian to a landscape of arid, barren Permian desert and from our earliest relatives, living in caves, to modern civilization. The Geopark's outstanding historical contribution, both in terms of the development of geological and archaeological sciences is astounding, from the Huttonian Theory, to the naming of the Devonian Period by Sedgwick and Murchison and even Pengelly's discoveries influencing world wide public opinion as to the antiquity of man. The shape of the Bay provided the naval fleet safety during times of crisis and thus was a catalyst for the building of the Napoleonic Forts while its sheltered natural harbours led to the growth of what, at one point, became the UK's largest fishing port. The beauty of the area influenced the early development of a tourism industry thus instigating the requirement for the exploitation of its geological resources in the form of extensive limestone quarrying, in addition to the marble and terracotta industries. The English Riviera resort towns of Torquay, Paignton and Brixham lie, like a be-jewelled necklace, around one of the most beautiful bays in England. The resort is a top destination for visitors from around the country and indeed the world and its history as a popular resort stretches back centuries. Today the resort continues to attract, entertain and rejuvenate a wide range of visitors who choose their holiday to suit - the sophisticated continental style of Torquay, the lively seaside fun of Paignton or the colourful maritime character of Brixham. The area's most famous resident was no doubt Agatha Christie, the most published novelist of all time. Over 2 billion of her books have been sold and it is said that she is outsold only by the Bible and Shakespeare! Torquay's Agatha Christie Mile, the Agatha Christie Gallery in Torquay Museum and Greenway, her South Devon riverside home, all make the area a sought after destination for her worldwide fans. The 21st century is seeing rejuvenated interest in this popular resort with top restaurants achieving coveted Michelin Stars and many hotels undergoing substantial investment despite the area being famous for the Hotel Gleneagles where John Cleese once found the inspiration for the world's most famous hotelier, Basil Fawlty. Peter de Savary is one of the latest hoteliers to invest in Torquay having created a beautiful boutique spa hotel at one of the coast's beauty spots. The stunning coast line features 20 beaches and coves and the highest concentration of Blue Flag beaches in England. The 20 mile coast path is part of the South West Coast Path and is complemented by many miles of country rambles and beautiful nature reserves. Famed for its fantastically warm micro-climate for centuries, the English Riviera never fails to live up to this reputation with the warm atmosphere and verdant foliage of a sub tropical resort. Throughout the parks and gardens and dotted along the esplanades and avenues, thousands of 'Torbay Palms' will assure you that this is indeed a resort like no other. This fascinating flora doesn't stop at the water's edge as the English Riviera even has an underwater nature reserve with corals and seahorses. A popular destination for a wide range of sporting and activity holidays, the English Riviera boasts some of the best sailing waters around the British coast. With over 50 sailing events in the Bay each year the summer season is filled with colourful sails, friendly competitive banter and the popping of champions' champagne corks. Highlights in the watersports calendar include the Brixham Annual Heritage Race in May, the three towns annual summer regattas and regular visits from cruise ships, international rallies and tall ships. With 16 square miles of sheltered waters it's a perfect place to learn to sail, waterski, kite surf or scuba. Along the 20 miles of coast there are 12 slipways, two marinas and a wide range of watersport activities on offer. The brand new Torquay Waterfront now offers boat users world class facilities and a warm quayside welcome for visitors strolling along to see the boats, shop or just sit and watch the world go by. As a long established year-round resort, visitors will always find a fantastic range of activities on offer and amazing attractions to visit such as the world class Paignton Zoo and the truly unique Kents Cavern with the earliest evidence of man in Europe. Away from the coast, Devonýs delightful rolling countryside holds many treasures to explore from pretty market towns to the striking beauty of Dartmoor. South Devon is famed for its food and boasts a very high concentration of organic food producers. Few visitors will miss the chance to savour the fruits of the sea, landed in the bustling port of Brixham. With nearly 400 quality assured accommodation providers to choose from English Riviera customers will find the ideal holiday, a warm welcome and many reasons to come back again and again. The unique combination of a superb geological resource, well-developed tourism facilities, a dedicated and innovative conservation trust and well-developed partnerships between the public, private and voluntary sectors makes this area well placed to develop a dynamic and successful Geopark, promoting geological heritage and sustainable development for the 21st Century.